Please remember to bring a casserole, salad, or dessert to share with others. At the first general meeting on January 26, Ralph Carhart and his board will be installed. We can be confident that they will help keep us focused on our common objective of preserving, protecting and sharing Fair Oaks history and heritage. For the past two years, I have served as your President. Thank you for giving me this opportunity. I believe the Society has made good progress in sharing Fair Oaks history during this time. Thanks especially to the officers and committee chairs for their commitment and support in this general effort. 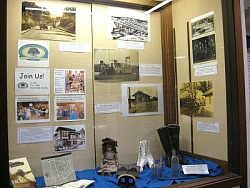 Continuing to enhance and display exhibits at the temporary History Center in the Fireside Room, with open houses as well as outreach efforts that included presentations and displays for the Fair Oaks Library Centennial celebration held at the Fair Oaks Library. Highlighting historical events and developments at quarterly general meetings, supplementing local resources with guest speakers. Ongoing efforts to have a permanent history center at the Old Fair Oaks Library. We participated in a focus group which provided input on a comprehensive Parks and Recreation Master Plan––we made known our continued desire to have use of the Old Fair Oaks Library building as our permanent history center. 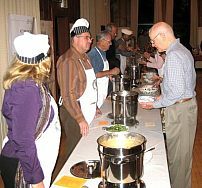 We raised additional funding for the future center by holding Soup Nights which have been very successful––we look forward to an even greater Soup Night next November 5. Using media and technology such as our quarterly newsletter and website to share the Fair Oaks story. 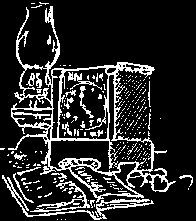 Jim Pearce has developed a section on our website for articles and pictures from the “Old Fair Oaks Homes” section in the newsletter. Coordinating with other history centers. 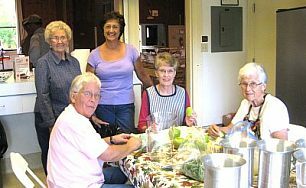 We are active in the Sacramento Area History Network, a consortium of historical societies. Recruiting new members to the society at the same time as involving current members in the work of the society, benefitting from the immense knowledge, skills and abilities in our community. Thank you for choosing me as you Vice-President for the last six years. I have enjoyed having the opportunity to bring historical programs of interest to the membership at our quarterly meetings. This experience helped me to learn more about my hometown and its history while serving my community. I look forward to joining the general membership at the long tables and enjoying historical programs to be offered in the future by our new Vice-President. I would like to thank Eileen Metzger from the San Juan High School Alumni Association for her presentation on San Juan High School’s history and upcoming 100 year celebration, a year long event in 2013. San Juan will be having a new look and vocational focus. The Alumni Association not only gets graduating classes together for reunions, but has given over 160 scholarships totaling over $200,000. January's presentation will be the Rennaisance Society from UC Sacramento. 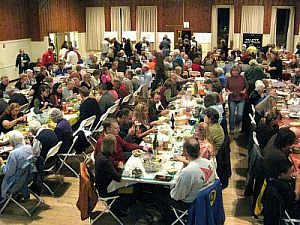 Once again, our fantastic Soup Night Committee did an awesome job creating another sell out event. This year, we didn't sell any tickets at the door as there were none available. For the most part, the reserved tables were very successful and will be continued next year along with selling wine by the glass as well as the bottle. This year we brought in about $7,000. Our out-of-pocket expenses were a little higher this year as we purchased some non-consumable items in an effort to reduce our overhead in the long run. More of the specifics will be shared at our January 26th meeting. Please be sure to thank all the committee members when you see them. And please especially thank Don Yost for all the bowls he donated. I think our last count was 94. We'll start planning for 2010 in another month and would appreciate any suggestions for improvement. Also, if you know of other potters that we can contact, please call Lynn Steen at 967-7135. Thank you to everyone who attended our event and made it such a wonderful evening. 1912: Martha Bracken, wife of W.E. Bracken of Pennsylvania, original investors in Fair Oaks who probably never lived here. This home sits almost at the end of Pennsylvania Avenue, north of Lemon Street. Originally it was a three bedroom, one bath home at the top of a 5 acre hill. Typical to that time period, the house had 2 closets, one in the hall and one in a bedroom. The Roses, who have owned the home since 1971, have added a master bedroom and bath, family room, enclosed the daylight basement, created a garage and included the service porch into their kitchen. 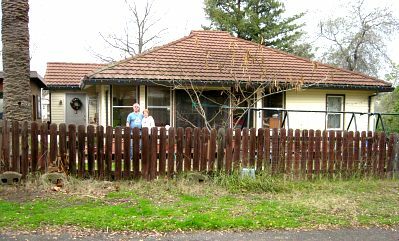 Don and Penny have physically done most of this work themselves throughout the 39 years they have lived in the house. Don tells of discovering original lathe and plaster with a variety of lumber used. In some cases the beams ended before the ground making them wonder how the house had stayed sturdy for the first 60 years. The original siding was redwood, their add-on used pine, which is now covered with vinyl. The kitchen has the original wood floors and some of the original shelving is used in the basement for storage. The backyard at one time had many trees, including olive, which were destroyed in a fire in 1988. There was also a barn, which has since been torn down. The front yard has two very tall palm trees probably planted in the early 1900s as do other old Fair Oaks properties. Not much information can be found about the previous owners. James S. Thomas emigrated from Wales as a 10 year old boy in 1865. He is on the 1910 census in Fair Oaks. Records show he owned this property, living with his wife, mother and sister in 1920. He was the pastor of the first Fair Oaks Presbyterian Church built in 1906. Ernestine Ambrose Miller –LaValle lived in South Dakota before California and had three husbands and many children. The Roses purchased the home from Pearl Adamczak who in 1971 was a widow with three grown children. Don and Penny are lifetime members of the Fair Oaks Historical Society. They were active parents when their 3 boys attended John Holst Elementary. Penny’s family owned La Posta Mexican Restaurant until they sold it in 2000. They plan to continue updating and maintaining this vintage Fair Oaks home. 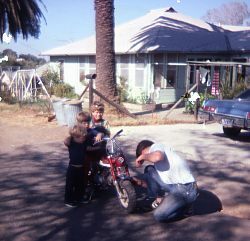 This article represents the transition of Old Homes Editor from Marilyn Pearce to Kay Schrudder (who wrote this piece). If any of our members have any additional information about this property or its previous owners, please let the Old Homes Editor know. The annual Christmas open house at the History Center was held On December 13. Cookies, hot cider and punch were served. 23 people signed our guest book. Visiting was enjoyed and several new people indicated interest in joining the society. On Nov 13 the History Center was open in the afternoon and evening for use by a theater group from Recreation and Parks. Thanks to all who volunteered time as monitors of the Center. 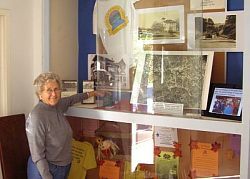 After the centennial celebration at the Fair Oaks Library, Lois and I were left with over 20 large, high quality prints depicting Fair Oaks history. So, when our turn in the Library showcase came up in December, we were ready. This is a photo of the completed display. Later, we refurbished the display case outside the Museum, including a new digital photo-frame in the lower right which rotated between photos advertising the FOHS and a short history of the Fair Oaks Bridge. It's great to gain attention for the Historical Society activities with all the people that pass by for the many activities at the main auditorium. Historical Moment: Pete White talked about summer jobs while he was growing up. He told of working at Aerojet. He also shared working for the San Juan Record, this really got him interested in the newspaper business, which led to him being the co-editor of his college. Pete read us an article about a “Chicken Plucking” contest that he wrote for his college newspaper. Pete also asked for volunteers to provide upcoming Historical Moments. Program: Sherry Wood, vice-president introduced Eileen Metzger, who spoke about the 100th Anniversary of San Juan High School. The celebration will be a year long celebration. She shared with us the new plans for the High School. It will have a vocational focus. The Alumni Association has given over $200,000 in scholarships to over 160 students. Applications for the Association were made available to our members. The minutes of the previous meeting were approved as published in the newsletter. 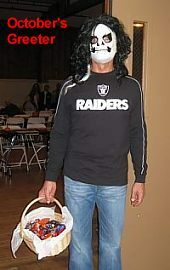 Treasurer’s Report: Joe reported that the raffle tonight brought in $150, and the wine $50. We have gained in our treasurery due to the sale of Soup Night tickets. Ways and Means: Claudia Thorne has taken over this position. She also reported that we have improved the quality of wine that is being served at the quarterly meetings. 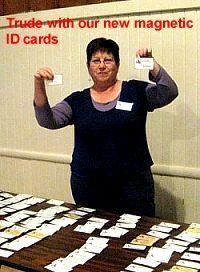 Membership: Trude Vasquez reported that we have new magnetic badges, with a case that will be here for the next meeting. Warning: anyone with a Pacemaker should not wear the magnetic badges, they should let Trude know and a pin badge will be made for them. She has worked out a system that badges will only be available for currently paid members. History Center: Lois Frazier reminded us that the December Open House will be December 13th at the History Center from 1-4 p.m.. We will be doing the Library display in November, Jim Pearce will help with the display. Newsletter: Marilyn Pearce reported the next newsletter will come out early in January. Publicity: Trude said that she has been sending notices of our meeting to 13 different sources, Several members reported they have seen the articles. 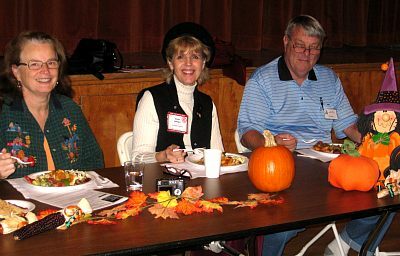 Webmaster: Jim Pearce announced that the Fair Oaks Thursday Club has a site linked to ours. There is a lot of changing information, we need to be checking it often. Soup Night: Claudia Thorn introduced the committee. Maria Brugger announced the five soups we will be serving. 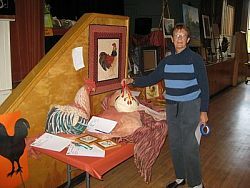 Lynn Steen reported that we have now received all the bowls needed for the event. At this point the event is sold out. Nominating Committee: Trude Vasquez reported that the following members have accepted the following positions: President, Ralph Carhart; Vice-president, Trude Vasquez/Maria Brugger; Secretary, Janet McWilliams; Treasurer, Joe Dobrowolski. Nominations were called for from the floor, none were made.Warren McWilliams moved that we approve of candidates, seconded by Lois Frazier. 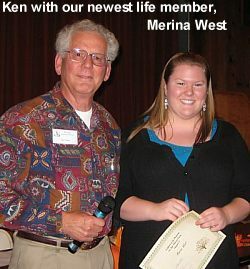 Life Membership Application: Merina West has applied for an Individual Life Membership. Motion to accept her nomination was made by Pat Vogel, seconded by Barbara Saunders. Motion passed. Merina was presented with her pin and certificate. Meeting adjourned at 8:15 p.m.